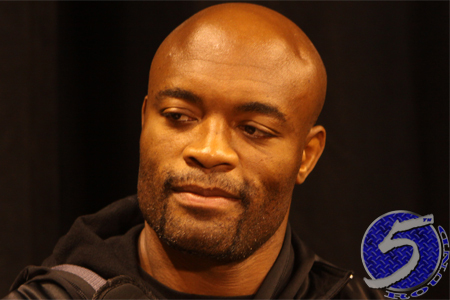 On Tuesday, it was announced former UFC middleweight king Anderson Silva (pictured) will return to action exactly 13 months and three days after shattering his left shin against champion Chris Weidman. Silva meets Nick Diaz, who is also ending his extended hiatus, at UFC 183. The January 31 show will take place at a yet-to-be announced venue in Las Vegas. The 185 pound tango headlines the pay-per-view broadcast. Silva is bouncing back from one of the most horrific injuries ever witnessed inside the octagon. Weidman checked his kick last December and Silva’s shin snapped in two in the most anticipated rematch in UFC history. Prior to Silva’s back-to-back losses to Weidman, “The Spider” posted a UFC record 11 straight title defenses. The 39-year-old is the most decorated champion in octagon history, but reigning light heavyweight champ Jon Jones is closing in fast with seven consecutive title defenses at just 27 years of age. Diaz inked a three-fight contract extension last week to end his second “retirement.” The 30-year-old initially announced hung up his gloves after losing a controversial decision to Carlos Condit for the interim welterweight title at UFC 143, a bout Diaz was positive he had won. He returned 13 months later to challenge then-champ Georges St-Pierre for this throne at UFC 158. Diaz was thoroughly trounced for a unanimous decision defeat and re-retired immediately after. I can’t think of another scrap that received this much hoopla where both fighters were coming off consecutive losses. No other bouts for the lineup have been reported at this time.